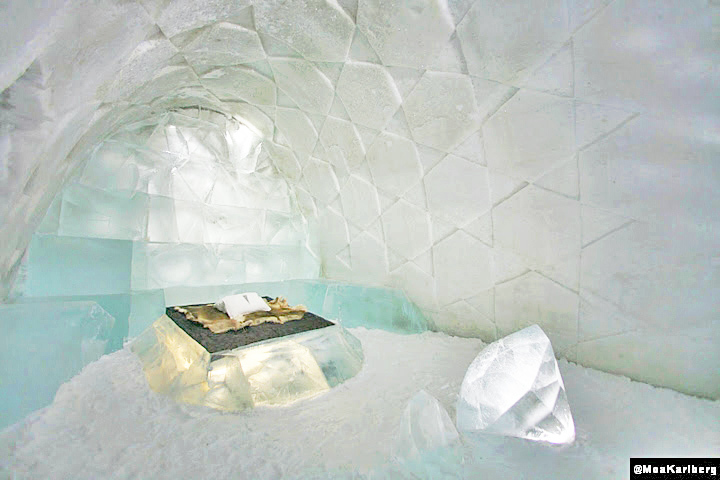 Diamond Genesis, also known as Room 339, at Sweden's Icehotel offers a uniquely decorated brand of frozen luxury. Designed by French artist and designer Antoine Weygand and architect Roland Toupet, this simple, striking room offers guests a bed placed atop an illuminated plinth, gigantic glowing diamond-shaped sculptures, and an arched ceiling decorated with precisely carved geometric patterns. 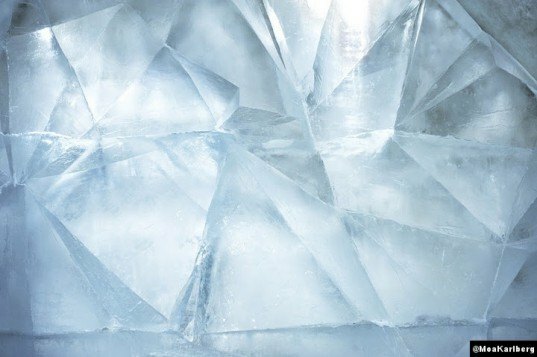 All of these elements are made of snow and crystalline ice, and they are kept at a frosty -5 degrees Celsuis "regardless of how cold it may be outside." The Icehotel, situated by the Torne River in Jukkasjarvi, has been rebuilt each year for over 20 years. An “Ice Farm” located nearby provides the Icehotel with an incredible 30,000 tonnes of snow and ice each year to construct the 60 room building. While that may seem like a huge quantity of frozen water, the hotel claims that 370 cubic meters of water passes Jukkasjarvi every second – that’s the equivalent of a new Icehotel passing the Swedish town every other second. Each incarnation of the Icehotel features a number of Art Suites by designers from around the world who contribute one-of-a-kind rooms to the project, carving their work out of the 2 tonne blocks harvested from the Torne River. The results are fairly staggering, and often whimsical – two of last year’s rooms were christened “Ice Fishing” and “Frigid Dare”. Diamond Genesis offers enormous ice-carved renditions of precious stones, and the Arktikos Suite invites guests to wake up surrounded by polar bears — made of snow, of course. Jukkasjarvi is a small village, purported to have a population of 900 residents and a thousand dogs, but as home to the world’s first hotel-meets-art-museum-inside-an-igloo, it has developed a name and an industry for itself. Over 55,000 people a year flock to the temporary accommodation to enjoy spectacular views of the northern lights, winter-time recreation, and of course the unique ice-sculpted art and architecture. Options for enjoying Torne River ice sculptures aren’t limited to Scandanavia either – in what appears to be a rather ostentatious out of context novelty, the Icehotel also owns bars in cities from London to Istanbul, in which all interior features from barstools to glasses to the bar itself are carved from imported Torne River ice. Rates for the Art Suites begin at around $112 per night, and they include back-up “warm” accommodations, winter clothing, and a morning sauna. The Icehotel, situated by the Torne River in Jukkasjarvi, has been rebuilt each year for over 20 years. An "Ice Farm" located nearby provides the Icehotel with an incredible 30,000 tonnes of snow and ice each year to construct the 60 room building. While that may seem like a huge quantity of frozen water, the hotel claims that 370 cubic meters of water passes Jukkasjarvi every second - that's the equivalent of a new Icehotel passing the Swedish town every other second. Each incarnation of the Icehotel features a number of Art Suites by designers from around the world who contribute one-of-a-kind rooms to the project, carving their work out of the 2 tonne blocks harvested from the Torne River. The results are fairly staggering, and often whimsical - two of last year's rooms were christened "Ice Fishing" and "Frigid Dare". Diamond Genesis offers enormous ice-carved renditions of precious stones, and the Arktikos Suite invites guests to wake up surrounded by polar bears — made of snow, of course. Jukkasjarvi is a small village, purported to have a population of 900 residents and a thousand dogs, but as home to the world's first hotel-meets-art-museum-inside-an-igloo, it has developed a name and an industry for itself. Over 55,000 people a year flock to the temporary accommodation to enjoy spectacular views of the northern lights, winter-time recreation, and of course the unique ice-sculpted art and architecture. Rates for the Art Suites begin at around $112 per night, which include back up "warm" accommodation, winter clothing and a morning sauna.